R. Michael Alvarez examines how voters make their decisions in presidential elections. He begins with the assumption that voters have neither the incentive nor the inclination to be well-informed about politics and presidential candidates. Candidates themselves have incentives to provide ambiguous information about themselves, their records and their issue positions. Yet the author shows that a tremendous amount of information is made available about presidential candidates. And he uncovers clear and striking evidence that people are not likely to vote for candidates about whom they know very little. Alvarez explores how voters learn about candidates through the course of a campaign. He provides a detailed analysis of the media coverage of presidential campaigns and shows that there is a tremendous amount of media coverage of these campaigns, that much of this coverage is about issues and is informative, and that voters learn from this coverage. 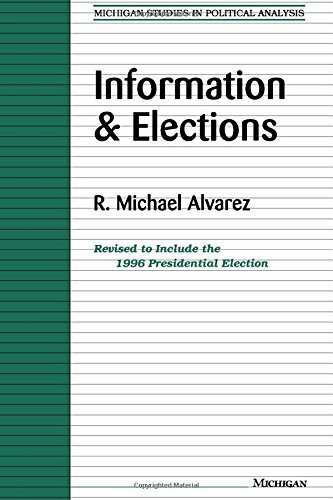 The paperback edition of this work has been updated to include information on the 1996 Presidential election. Information and Elections is a book that will be read by all who are interested in campaigns and electoral behavior in presidential and other elections. "Thoughtfully conceptualized, painstakingly analyzed, with empirically significant conclusions on presidential election voting behavior, this book is recommended for both upper-division undergraduate and graduate collections." --Choice R. Michael Alvarez is Associate Professor of Political Science, California Institute of Technology.